“Having a speech in front of people is not a problem for me anymore. I learned about leadership, confidence, the way to communicate clearly and knowledge through dongari HUSE-C,” said Kim Jang-il, a president of Hanyang University Speech Education – Cultural Club (HUSE-C) and sophomore in the Department of Physical Education. 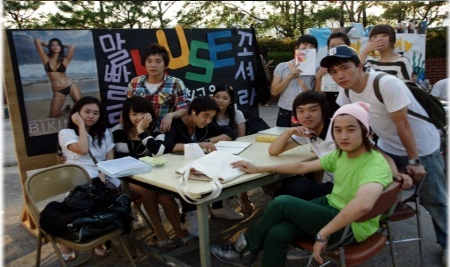 HUSE-C, a Korean speech dongari at Hanyang University (HYU), was established in 1970 as one of the main clubs on Seoul campus. Every Thursday, members of the club gather in a classroom and practice speech. The executives of the club give three topics before Thursday. Topics are about current social problems, personal assertions and so on. Each member gives a five-minute speech on one of these topics in front of all the members. After the speech, seniors give feedback to every speaker. So, did the members of HUSE-C know about speech skills from the beginning or before joining the club? Of course not. “When we joined this club, it was even hard to stand in front of people. Only if you are interested in speech, we would be pleased for you to join us even though you hesitate to speak in front of strangers. We offer you enough speech training through social meetings, so you do not need to worry,” said HUSE-C president Kim. Moreover, every year, many freshmen strive to enter HUSE-C. The fame of HUSE-C at HYU is because of members from various majors. Diverse majors of the club members give several benefits. “The biggest advantage is that it is easy to make connections with peope in various majors at school,” said Kim Ah-young, a sophomore in the Division of Human Ecology.